Creative's new Bluetooth speaker system | What Hi-Fi? 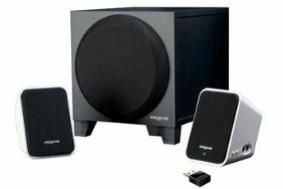 The £130 system uses a subwoofer with an internal amplifier to drive both itself and the two ultra-compact satellite speakers. 10W is available for the sub, and 7Wpc for the stereo speakers, and the system claims a frequency response of 40Hz-20kHz. A plug-and-play USB transmitter is provided for use with computers without built-in Bluetooth, and the system uses the apt-X transmission codec from APTX, said to give high quality and minimal delay. The system is available online from Creative's UK shop, as well as from authorised retailers.